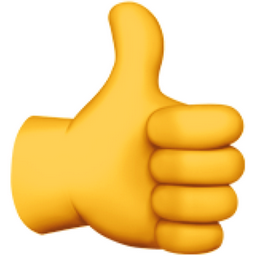 A thumbs up sign is used by humans to say everything is good. A fist with thumb pointing straight up towards the sky. A hand sign for approval or encouragement for a job well done. Nice work! The opposite (antonym) of a thumbs-down sign. Potentially used for centuries by people, such as during the days of the Roman empire and the gladiators in the Colosseum (Coliseum). Audience members and potentially Caesar would use the thumbs up gesture to indicate a job well done or approval of the performance. Can also be used to communicate hitch hiking, which is the act of making passing drivers aware that you would appreciate a ride down the road. A very positive and enthusiastic emoji. Yeah! Rock on!